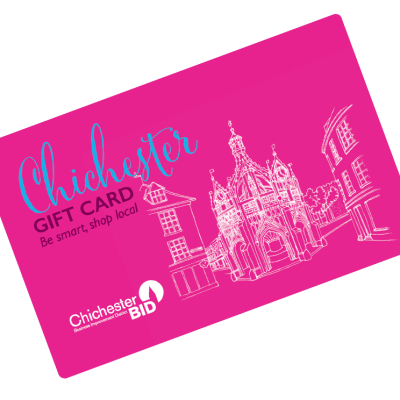 The Chichester Gift Card can be used in a wide range of local businesses just choose the quantity and value of cards you would like below! Please note that any order placed before 1 pm will be processed on the same day. Orders placed after 1 pm will be processed on the next working day. We are only able to fulfil online orders during Monday-Friday excluding Bank Holidays. When ordering a Chichester Gift Card you will be able to select your preferred delivery option. Costs include an administration fee. Orders are dispatched via Royal Mail. Standard Delivery: £2.50 – Orders received by 1 pm will be posted the next day, delivery service is 3 – 4 days depending on the time your order is received. This option does not require a signature and there is no proof of delivery. There is no compensation with this delivery option. Special Delivery Next Day (orders placed before 1 pm): £7.50 – Orders placed by 1 pm are guaranteed for delivery 1 pm next day Monday to Friday. The recipient will need to sign for the package upon delivery. Compensation cover up to £500 is included on this delivery option. You will receive your Tracking number once your order has been processed. The above shipping options are only available for orders within the UK only.